We are a long established chocolate fountain hire company. 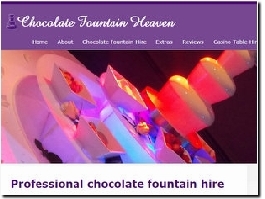 We provide chocolate fountain hire for the whole of the South of England and beyond. Chocolate fountains are perfect for you wedding, party or corporate event. We are a small family company operating in Wales and surrounding counties, offering bespoke chocolate fountain hire suited to gatherings of any size. We are a leading supplier of chocolate fountain hire for wedding, parties, corporate events and proms, with the unique ability of a liqueur infused chocolate fountain. We cover the south east of England and London.